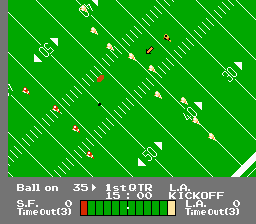 This simple American football game is a port of the arcade classic. 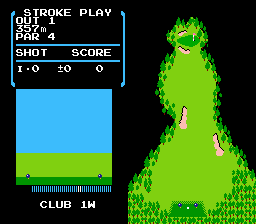 You can select the skill level of your computer opponent: high school, college, pro, play-offs, and Super Bowl. 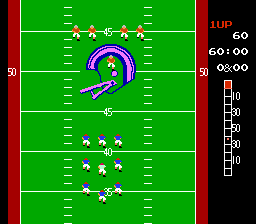 The game lacks a license from either a professional football league or a players association, so players and teams are generic. 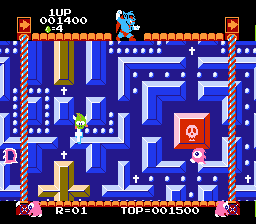 Changes from the arcade original include the ability to play as both offense and defense during a game as well as a simultaneous two-player versus mode. 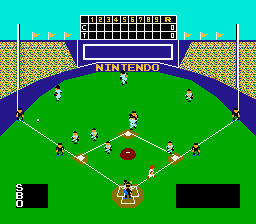 This simplified version of baseball was one of the NES' launch titles in North America. 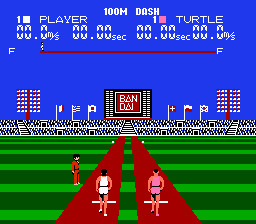 Though it lacks an official license from any real baseball league and therefore features no real team names (just letters, all the teams play identically), uniform colors are meant to represent Major League Baseball franchises (in the Japanese version, they're meant to represent teams in Nippon Professional Baseball's Central League). 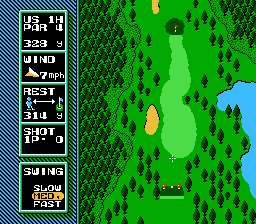 The gameplay is very basic, consisting mostly of pitching and batting, with most field play being automated by the computer. Players need to adjust position before bouncing the ball away. Home run may be scored randomly. Fouls are present here, no speech however. 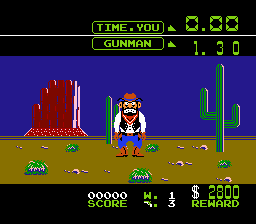 Game is for NES & FamiCom, but only NES version is legible. 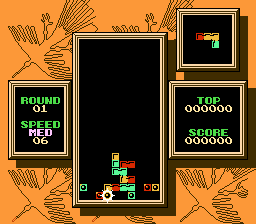 This arcade-style game never made it to the United States, supposedly due to Nintendo of America's censorship rules regarding religious imagery, but was released in Japan and Europe. 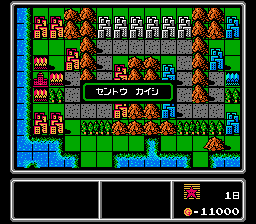 As the dragon Tamagon, you must "attack the Devil's World" while avoiding (or defeating) various enemies and obstacles. The Devil hinders your progress by changing the direction the screen is moving, putting you at risk of being crushed or encountering an enemy. 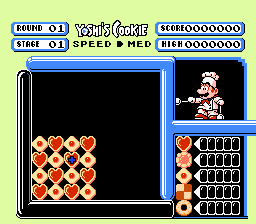 Some levels are cleared by collecting all dots on screen (which can only be achieved while holding a cross) or by collecting all four Bibles and returning them to the seal in the middle of the level. 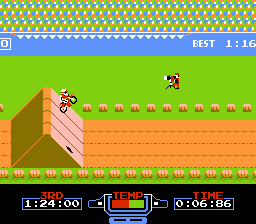 Also includes a simultaneous two-player co-op mode. Climbing in high-mountain areas to 32 tops. 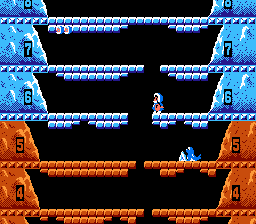 Floors 7; 8 & bonus stage are slippery. 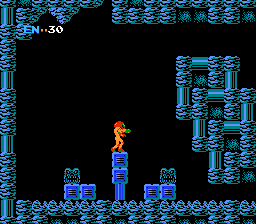 Remember to: hit the seals, watch out for yourself and plan your jump strategy correctly. 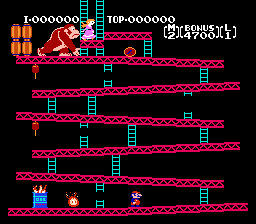 Collecting any of the items in bonus stages is not necessary. 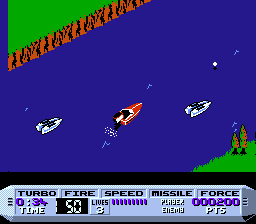 For NES & FamiCom, but seals are available only in FamiCom release, yeti seems to be a replacement in NES release. Choose from the United States, Sweden, Czechoslovakia, Canada, Poland, or the Soviet Union. 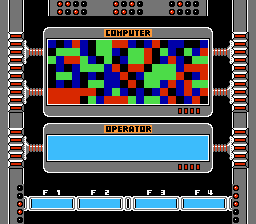 Assemble a team by selecting from different types of players and take on the computer or a human player. 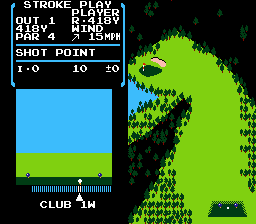 A speed option allows you to set the tempo of the game and length of rounds. 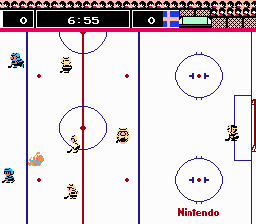 Ice Hockey even includes fights on the ice, which can break out into full team-on-team brawls. 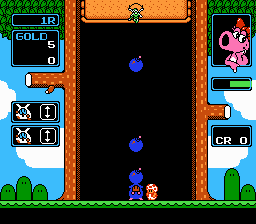 Hyrule's Princess Zelda has been kidnapped by Ganon, and it's up to the green tunic-clad Link to save her. 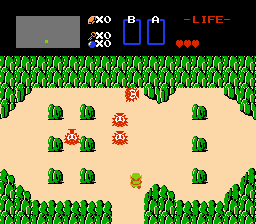 Using a variety of weapons, Link will have to battle enemies and transverse the massive kingdom of Hyrule to find secret underground dungeons where monsters guard the seven pieces of the shattered Triforce. 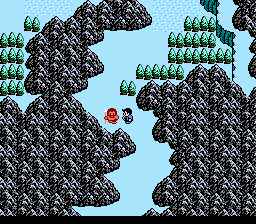 Along his way Link will find assistance from wise old men and women hiding in caves. 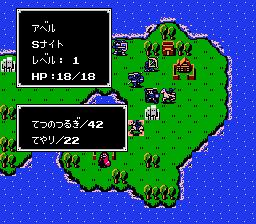 He'll have to find rupees to buy items and upgrades for his weapons (or he could just try his luck at earning rupees through the "Money Making Game"). Once Link has reassembled the Triforce, he will have to enter Death Mountain and take on Ganon for the fate of Princess Zelda and Hyrule. 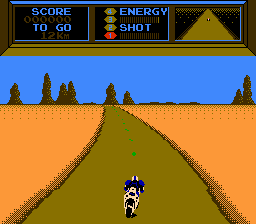 Motorcycle with shotgun riding game through 9 stages. Endurance mode available and solo courses. 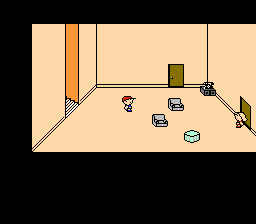 This game is set in 2112. 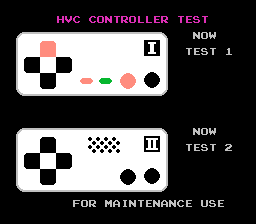 For FamiCom and NES. 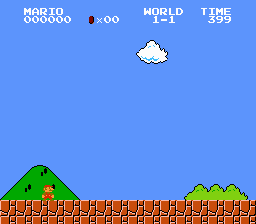 US title Mario's Time Machine! 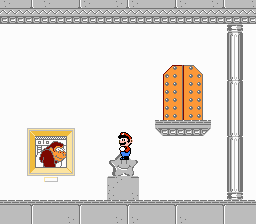 Bowser has used a time machine to steal various artifacts from throughout history to display in his museum. 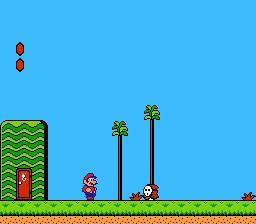 Only Mario can use that time machine to return those items to their rightful times, learning interesting historical facts along the way, before a final showdown with Bowser himself! 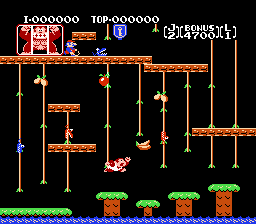 Japanese title Kaettekita MARIO BROS.
Japanese title (kanji) かえってきた　ＭＡＲＩＯ　ＢＲＯＳ. 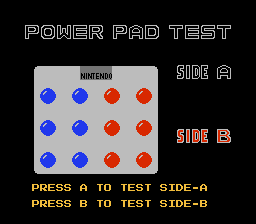 A simple test program for the Nintendo Entertainment System's PowerPad accessory. 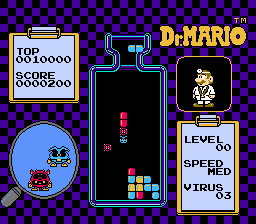 Long considered the "holy grail" of NES game collectors, this competition cartridge includes truncated versions of Super Mario Bros., Rad Racer, and Tetris. 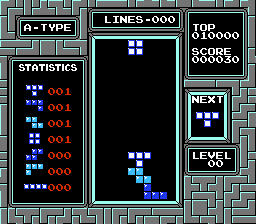 Compete in all three within a time limit to achieve the highest score! 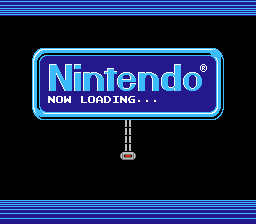 Unplayable in some emulators due to a DIP switch on the cartridge that the emulator must be programmed for. 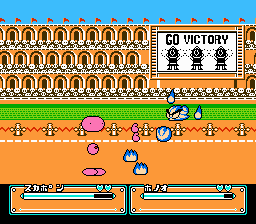 This simple pinball game was one of the launch titles for the NES in North America and Famicom for Japanese market. 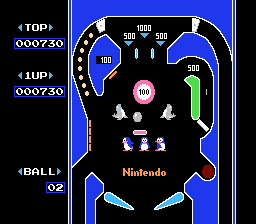 The pinball table is split between two screens (upper and lower), with a third screen used for a Breakout-style bonus round featuring Mario and Pauline from Donkey Kong. 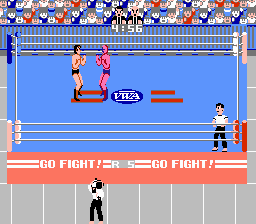 Play as Fighter Hayabusa, Starman, The Amazon, Kin Corn Karn, Giant Panther, or King Slender and challenge the rest of the Video Wrestling Association roster to become the VWA Champion! Defend your title enough times and you'll be granted a title unification match with the mysterious champion of the Video Wrestling Federation, Great Puma! 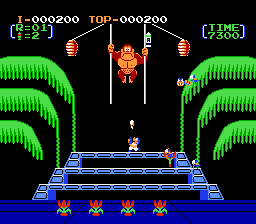 Each wrestler has his own unique set of finishing moves, from Starman's Flying Cross Chop to The Amazon's Outlaw Choke to Fighter Hayabusa's Back Brain Kick. 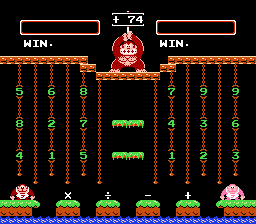 Remember: A winner is you! 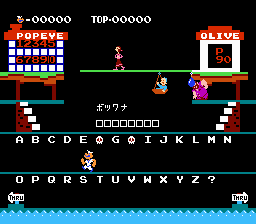 Japanese title Mike Tyson's Punch-Out!! 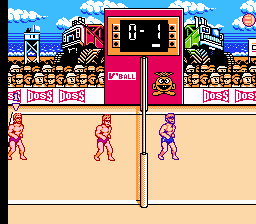 Play as Little Mac and take on a slew of boxers like Glass Joe, Bald Bull, and Soda Popinski! 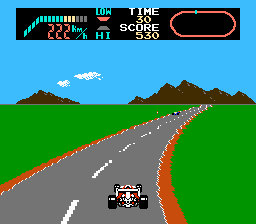 Become the champion in the minor, major, and world circuits and take on the man himself, Mike Tyson! 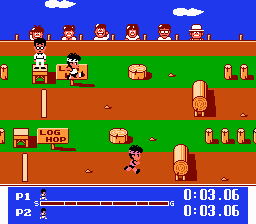 (Tyson was replaced in a later release by a fictional character, Mr. Dream). 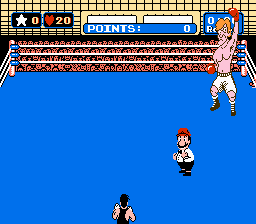 Defeating Tyson has been described by many as one of the most difficult video game accomplishments of all time. 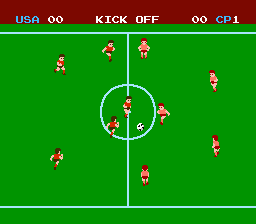 Simplified soccer game for NES & FamiCom. 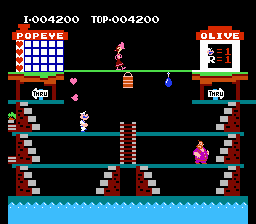 Playing with NPC opponents or human player. 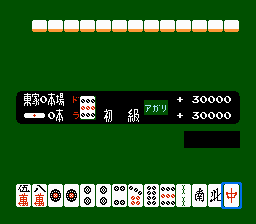 Off-sides are random, no fouls, substitutes, accidental goals or any cards are implemented here. 5 skill levels, 7 countries (graphical changes only) and 3 lengths of half time. 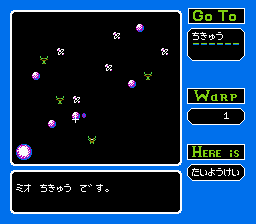 As Mike Jones, star baseball player, you'll need to transverse many exotic islands and fight monsters with your magic yo-yo to rescue your uncle from the evil alien Zoda. 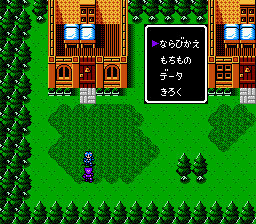 Along the way you'll encounter colorful characters who will help you on your quest. 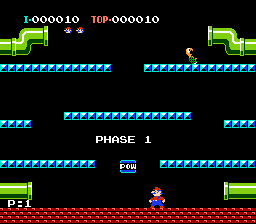 US title Super Mario Bros.
One of the most famous and beloved games ever, Super Mario Bros. set the standard for the platformer genre. 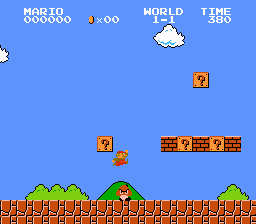 Until 2009, it was the best selling video game of all time. 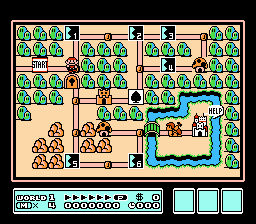 As Mario (or Luigi), you'll have to travel across thirty-two unique levels ranging from snow-covered tundras to underground caverns to vast oceans, each filled with Goombas, Koopa Troopas, and Piranha Plants to rescue Princess Peach from Bowser. 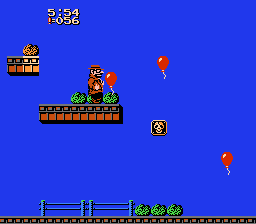 Aiding your quest will be useful power-ups like the Super Mushroom, Fire Flower, and Starman. 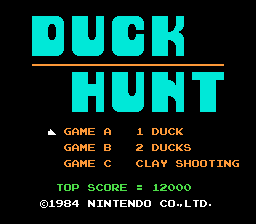 Contains Super Mario & Duck Hunt on one cartridge. Sold only in the USA. 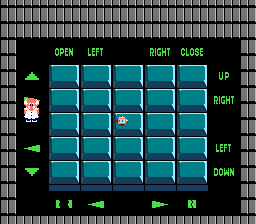 In this North American sequel to the classic Super Mario Bros., Mario, Luigi, Toad, and Peach venture across twenty levels of the magical kingdom of Sub-Con to rescue its kidnapped inhabitants and defeat the evil usurper king Wart. 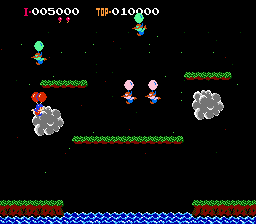 SMB2 (originally an unrelated Famicom Disk System game titled Doki Doki Panic in Japan but retooled as a Mario game for its US release) was the first American game to establish that Luigi has a higher jump than his brother and that Peach can float using her dress, both of which would become defining characteristics in later titles. 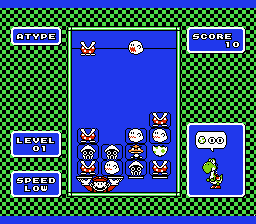 It also introduced a whole new cast of enemies to the Mario universe, including now-regulars like Shyguys, Bob-ombs, and Birdo. 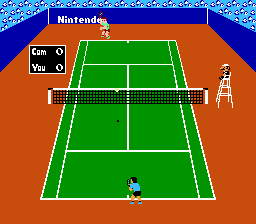 Simple tennis game for NES & FamiCom. 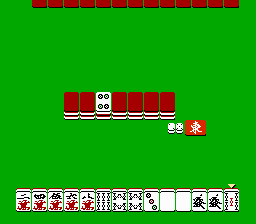 Double player mode available only in doubles. 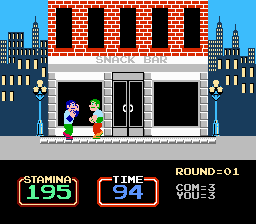 Simple fighting on polar day city streets. 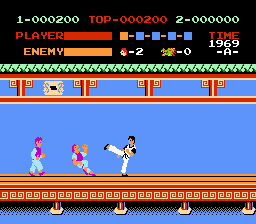 Only hand fight, no kicks. Cops arrive randomly and after 99 seconds. 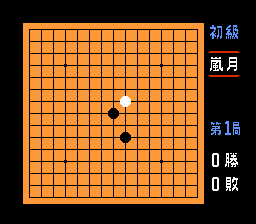 Opponent is down every 3 rounds or player after 3 rounds (not always necessarily in a row). 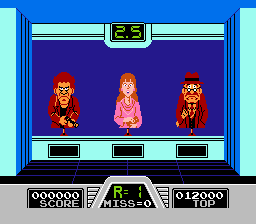 For NES & FamiCom. 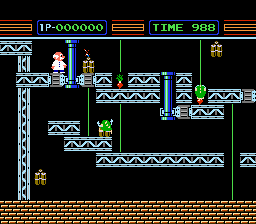 Destroying walls and ladders, sometimes with pseudo-helper (no score when he hits first). Watch out for all the enemies. 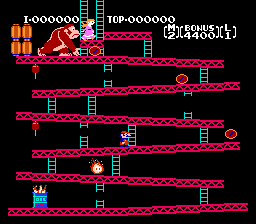 Plan your strategy in ladder levels. 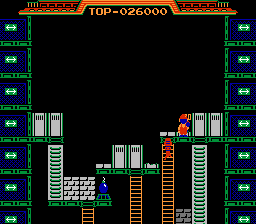 100 levels within 7-story buildings. 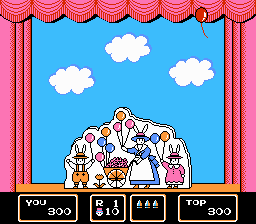 Contains bonus stages (who finds the coin first - wins). 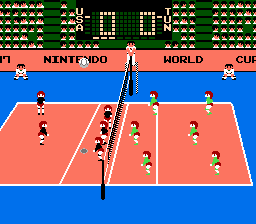 For NES & FamiCom. 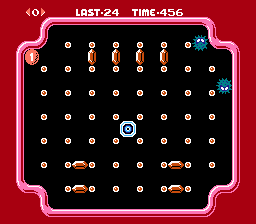 A sleeping spell has been cast on Princess Zelda, and it's up to Link to remove it by assembling a variety of magical crystals. 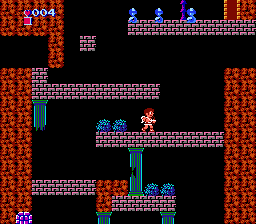 These crystals are hidden in palaces scattered throughout the vast land of Hyrule, and making matters more difficult, Link is being pursued by former minions of Ganon, who want to resurrect their fallen leader by killing Link and sprinkling his blood over Ganon's ashes. 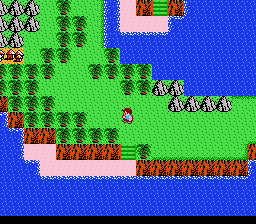 As part of his quest, Link must visit villages and learn magic spells. 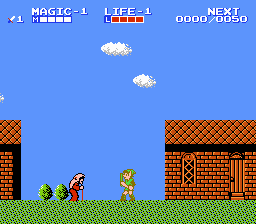 This game marked a huge departure from the first Zelda--rather than being an adventure game with a "top-down" perspective, Zelda II combines a "top-down" overworld map with platforming levels and RPG elements. 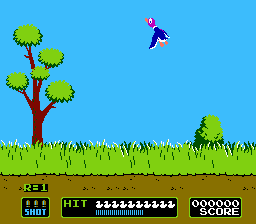 Often considered the "black sheep" of the Zelda series.